Today, CNN reported that home prices reached their lowest point in more than 10 years. According to the National Association of Realtors, the median U.S. home price fell from $219,000 in 2007 to $154,700 as of January 2012. While this fact may be good news for buyers, it certainly is a negative development for sellers. Moreover, it is a negative development for the country as a whole, because it affects homeowners’ spending behavior. Lower housing prices negatively influence consumer spending behavior, because of the wealth effect. According to this economic principle, by “making people feel less wealthy,…the decline in home values inhibits consumer spending and hampers the nation’s stop-and-start economic recovery.” Since consumer spending is responsible for roughly two-thirds of GDP, a persistent decline in home prices does not bode well for the current anemic economic recovery. It is possible to model how the 29% median home price decline impacted the median family over the last five years. The chart at the top of this page shows how a homeowner’s equity would decline to less than zero if that homeowner bought a house in 2007 at the median home price of $219,000 with 20% down and a 30-year fixed mortgage rate of 5%. From 2007 to January of 2012, this hypothetical family would have invested a total of ~$59,000 in their home, yet would have negative equity of ~$6k. Not only has their home equity been completely wiped out, but also their debt obligations require them to invest an additional $6k just to break even. In other words, if they sold their home today, they would lose more than their total investment. 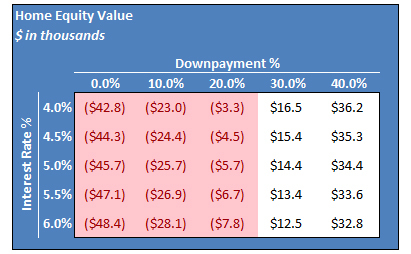 In this case, a 29% depreciation of their home represents a 109% decline in their equity. That said, families that had lower mortgage rates and took on less mortgage debt at the onset, would be relatively better off today than those who did not, as the chart above shows. However, everyone is poorer off by the tune of $7 trillion in household wealth according to a recent Fed white paper. Until this imbalance corrects itself, people will be belt-tightening for some time to come. I know I sure am. This entry was posted in Finance and Economics, Investing, Policy, Politics and tagged Home Prices Hit Lowest Point in More Than Ten Years, Housing, Housing prices, Median Housing Prices, Mortgage. Bookmark the permalink. To be sure, home prices bubbled to clearly unsustainable heights, and we don’t want that again. 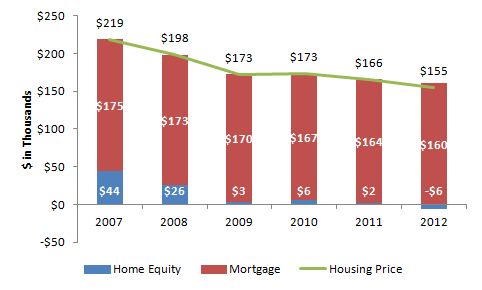 Home prices have to balance out at realistic levels and then we’ll start a slow increase in value. The $7 trillion was debt driven “fake” bubble value. That doesn’t deny anything you say about the practical impact. I’m just noting that this is a necessary aspect of the bubble correction. The steep decline from 2007-2009 is probably best viewed as a housing market “correction,” but the slow decline from 2010 on is probably more attributable to job losses. The timeline from losing one’s job –> defaulting on one’s mortgage –> initiation of foreclosure –> completion of foreclosure –> sale of the foreclosed home is quite long, often spanning years. Therefore, it makes sense that recovery in the housing market should lag recovery in the job market by a few years. Although employment has hardly “recovered,” the bulk of the recent recession’s job losses occurred before the end of 2009. Foreclosure filings peaked in 2010 and are now at a 4-year low. Until the housing market “clears” we can expect that these foreclosures will continue to depress home values (and consequently, the rest of the economy via the wealth effect Sean discusses), but the good news is that the beginning of the recovery appears to be right around the corner. As usual, all excellent points. I agree that prices needed a correction. That said, I think we’ve over-corrected based on the same metric that the Ecomomist used to call the bubble in 2003/04 – rent-to-mortgage ratios. Right now, you can charge more rent nowadays than it costs to pay a mortgage – a sign of an over-correction. Excellent points from both of you! I have a realtor friend (a couple actually) who think that they are starting to see signs of life. We’ll see. I hope you’re right, Scott! I can put a human face on the housing situation. We bought our home in 2005. We got a 6% interest rate on a 30 year fixed mortgage. We knew how much we could afford per month and did not go over our budget. We bought a modest home, in a good neighborhood. At the time we bought our home, housing prices were rising, fuel by many people who were buying homes as investments with no intention of living in them. The consensus was that if you were a family looking for a home, you should hurry up and buy before housing prices leveled off at a prices the average American could never afford. Wish I knew then what I know now. Every time I write that mortgage check I want to bang my head on the desk, knowing that If we had only waited a few years we could have twice the home for half the money. The temptation to just walk away is great, the couple next door to us did just that and their home has been vacant for three years. The house they left is in limbo, they do not claim it and neither does the bank yet because the foreclosure is still pending. The situation we are in is of our own making and we will continue to scrimp and pay our mortgage, thankful that we still can, and thankful to have a roof over our heads. The frustrating part is that there have been various programs with varying degrees of success, to help those who bought homes they couldn’t afford, to avoid foreclosure, But there are no programs to help those who are upside down, to refinance. We save, we make do, we don’t’ upgrade anything unless it’s to replace something beyond repair. Unemployment here is higher than the national average, and there are empty strip mall, and half full subdivisions everywhere. There are no quick and painless answers, but hopefully the bottom has been reached and things will start to turn around.